“Therefore, since we have been justified through faith, we have peace with God through our Lord Jesus Christ, through whom we have gained access by faith into this grace in which we now stand” (Romans 5:1-2). 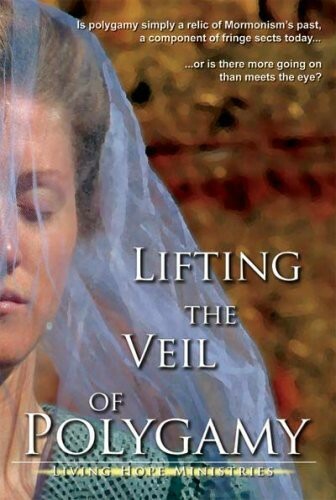 Lifting the Veil of Polygamy is another production by Living Hope Ministries (now also Source Flix). This film is a documentary of the mess Joseph Smith, Jr. bequeathed to America in the form of polygamy. The viewer is introduced to many former LDS and FLDS (I am using this term loosely to refer to all the various Mormon fundamentalists groups that hold to polygamy), whose lives were in turmoil as a result of Smith. Both LDS and FLDS declare Smith to be their founding prophet, so the film asks who more accurately follows him. Mainline Mormons (LDS) have given up polygamy, though they still believe they will practice it in eternity. This is seen in their work for the dead, in which a man may be sealed to more than one wife. As of 1890 when Wilford Woodruff brought about the Manifesto, LDS no longer practice plural marriage with all parties living here on earth. In a sense though, polygamy is still practiced by certain faithful LDS men whose faithful LDS spouse dies. How? These men are at liberty to get sealed to another faithful LDS woman. Since these men are still married to their first wife (it is for time and all eternity after all), then being sealed to another wife for time and all eternity entails plural marriage is in effect. As a matter of fact, three current LDS apostles--Dallin Oaks, L. Tom Perry, and Russell M. Nelson--are all widowers sealed to another woman now living. Since FLDS have never given up practicing this doctrine for here on earth, at least in this respect they more closely resemble their founding prophet, who had 34 documented wives on earth. The FLDS seem to be more faithful to their principles. They don’t care about marketing, public relations, and having everyone liking them. They don’t come up with convenient revelations in order to fit better in society. They, just like the founding LDS prophets, break the law in order to remain faithful to what they believe God has spoken. As a result of the Manifesto in 1890, both groups think the other is outside of God’s channel of authority and thus are in apostasy. The film does a great job at showing all the various Mormon groups that claim Smith as their founding prophet. This demonstrates another mess. The only rationale individuals in all these groups give for their divine authenticity is their own specific burning in their bosoms. This is especially problematic for all groups when they deleted the original 1835 D&C 101:4, which stated, “Inasmuch as this church of Christ has been reproached with the crime of fornication, and polygamy: we declare that we believe, that one man should have one wife; and one woman, but one husband, except in case of death, when either is at liberty to marry again.” This section was removed in 1876, and replaced by the endorsement of polygamy in section 132. One thing the film did not do a good job with is wrestling with current LDS understandings of D&C 132. The film assumes an FLDS understanding of the passage throughout. As such, the passage speaks of polygamy according to the proper authority (“the new and everlasting covenant”) as the only way one may be exalted in the afterlife (provided one lives worthy of it as verse 26 states). The section clearly says that those who are not sealed in this way for time and all eternity end up being servants to the exalted ones or gods (15-18). So what will FLDS say to some LDS like Alma Allred, who claims that verse 19 entails that one may be a monogamist--“if a man marry a wife by my word” (emphasis added)--married according to this proper authority, and still be offered exaltation (cf. 26:40 of linked video)? Former FLDS Doris Hanson of A Shield and Refuge Ministry talks about verse 21 indicating that one cannot be exalted without practicing polygamy, but the immediate context of verse 19 gives no indication of polygamy. Of course FLDS have responses here, but the film gives none of this interaction. The film does a great job in showing many LDS converting to fundamentalism due to becoming aware of the historic position, and worrying about not making it to God and becoming gods themselves. These individuals desire to be consistently aligned with the early prophets of their Church. The film also does a great job in showing how damning polygamy is to individuals and families. The film becomes rather emotional, but I find this appropriate given the subject matter. Poverty, fathers neglecting their children due to having too many, yet sexual abuse of children is not unusual, wives worrying if they are worthy enough in competing with other sister-wives to earn the husband’s favor, as well as loneliness are just some of the emotionally wrenching issues that result from Mormon polygamy. Dysfunctional families are the norm under these circumstances. Polygamy, if anything, ought to demonstrate that one can never be worthy enough. Marriage complicates life. Multiple marriages complicate it even further. Those who think they will be worthy enough to become gods in this system are living in denial. The answer for this mess is not to redouble one’s efforts in being worthy. Lifting the Veil of Polygamy’s best feature is offering the ultimate answer for this mess in the person of Jesus of Nazareth. He alone is the worthy One, and He gives us His worthiness as a free gift. To view or purchase this video, see here.